How Many Contact Sensors Does Your Security System Need? Of all the security devices out there, contact sensors might seem the least interesting. They're small, simple and unobtrusive, with a single function: to detect the opening and closing of doors, windows, cabinets and drawers. They're also one of the most essential components of a smart security system. The more contact sensors you have, the smarter and more versatile your system will be. 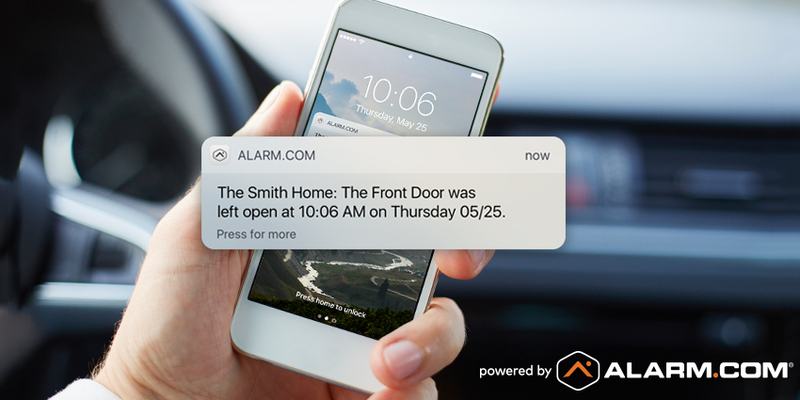 The average smart home security installation by an Alarm.com service provider, for example, includes ten door, window and motion sensors to detect and alert you to activity around the home. (That's a far cry from some off-the-shelf products, which come with far fewer). Will you use all ten? Well—contact sensors aren't just for catching burglars. 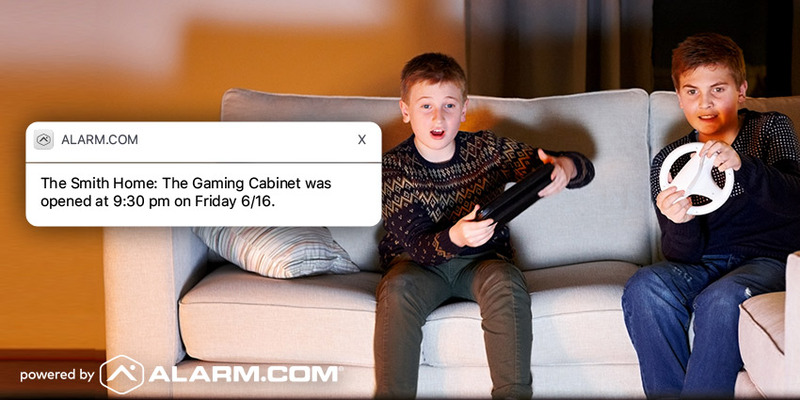 Thanks to Alarm.com's customizable alerts and notifications, they can let you know about all types of important activity, from security breaches to toddler shenanigans. They can also trigger other smart devices into action as part of your home automation setup. In fact, it's easy to list ten different places to use them. 1: Front door. With so much activity happening around your front door, a contact sensor is essential for early awareness of activity that could mean danger. In a break-in through the front door, this sensor is the one that alerts the security system, triggering the countdown to an alarm or potential Crash and Smash signal. It has plenty of everyday uses too. It can trigger an alert if your toddler learns how to open the door, or your school-age kid doesn't close it, or if your teen is opening it after hours. It can trigger a video camera to record and send you a clip, or trigger your smart thermostat to set back and save energy, preventing you from heating the neighborhood. Paired with a doorbell camera and a smart lock, it'll make your front door the smartest on the block. Find out more about smart front doors here. 2: Back door. Like to stay in bed a little later on the weekend? Chances are your children would rather be active. Sometimes, this means exploring the yard. A contact sensor on the back door, connected to Alarm.com and its Insights Engine, can let you know when something is amiss. 3: Door to the garage. With cars, tools and forbidden equipment, your garage is a magnet to your curious kids. A contact sensor on this internal door gives you immediate awareness if they're exploring it. You can set this notification to "weekdays only" so you won't get alerts when you open the door yourself on weekends. 4: Nursery door. if your toddler's room is upstairs, you'll sleep better knowing that if they go wandering in the night, you'll be alerted as soon as they reach the landing. As well as creating an alert, you can have this sensor trigger your landing light with an Alarm.com automation rule. 5: Man Cave Door. Unlike Stew McVicar's Alarm.com-powered Cubs fan cave, your chill-out space probably doesn't need a contact sensor on every cabinet. It's still worth protecting your gameday snacks, though. 6: Downstairs windows. Did you know that one third of all burglaries are enabled by an unsecured window or door? With a contact sensor on each downstairs window, you can verify that they're all secure before leaving home or going to bed, with a glance at your Alarm.com app. You can also get a reminder if you leave home with a window open. 7: Children's windows. Your kids know better than to open their bedroom windows without permission. Does that mean that they won't? A contact sensor on every bedroom window, ready to trigger an immediate notification, is a smart safety essential for when kids' curiosity gets the better of them. 8: Videogames cabinet. You trust your kids to do their homework when you're not there… right? Just in case, it's easy to add a contact sensor to the cabinet where the games console lives. You can set up an alert that lets you know when it's been open for too long. 9: Medicine cabinet or pillbox. Last time you were prescribed antibiotics, did you remember to take them every day without fail? It's easy to forget and miss a day. 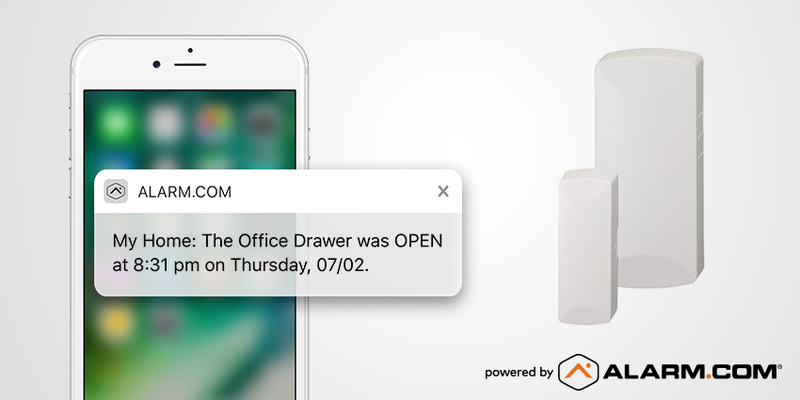 With a contact sensor on your medicine cabinet, though, you can set up a "no-show" reminder that alerts you if you fail to open the cabinet by a certain time every day. If you have an elderly loved one living with you, a contact sensor added to their pillbox is a non-intrusive way to ensure they're taking their medications, without having to ask. Find out more about our Wellness solutions here. 10: Freezer door. You like stocking your freezer with good food. Your family like opening it to get ice cream. Somewhere down the line, you're going to experience a meltdown when they leave the freezer open. 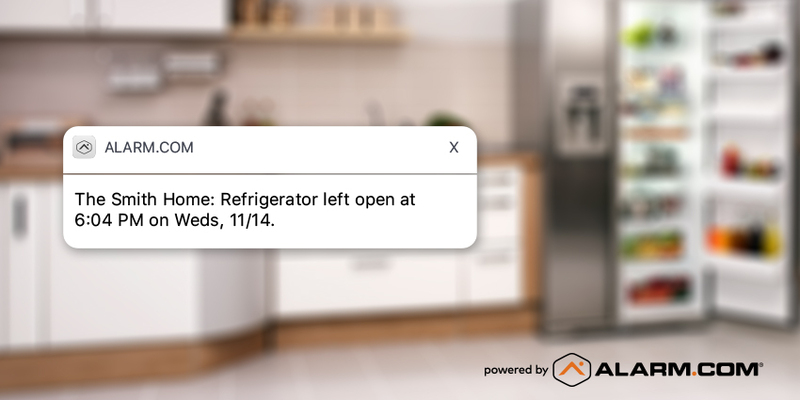 Keep your cool (and your food) by adding a contact sensor to the door, then creating an alert that notifies you if the sensor is open for more than two minutes. Where else could you use a contact sensor? Our list isn't exhaustive. From screen doors to cigar humidors, Alarm.com-powered contact sensors can be applied virtually anywhere where you need to know about activity. To find out exactly how many you need, start working with an Alarm.com service provider today. Connect with a service provider near you by entering your ZIP code in the box below.